This soundtrack is timeless, and subtle. Turn it down for a creek or babbling brook, turn it up (just a bit!) for a stream or river. The feeling of real water flowing is almost startling, but quiet and slow. It is set in an open ambiance with forest nearby, and even has wind in the sky above you. Use it for a creek, stream or river in any meadow or valley and it will attract all kinds of critters and birds, we promise. 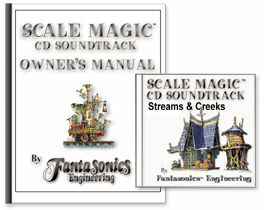 The CD includes both day and night soundtracks, and of course, our Scale Magic imaging.